What lessons can we learn from the Ancient Greeks? What lasting contributions did they make to human civilization? 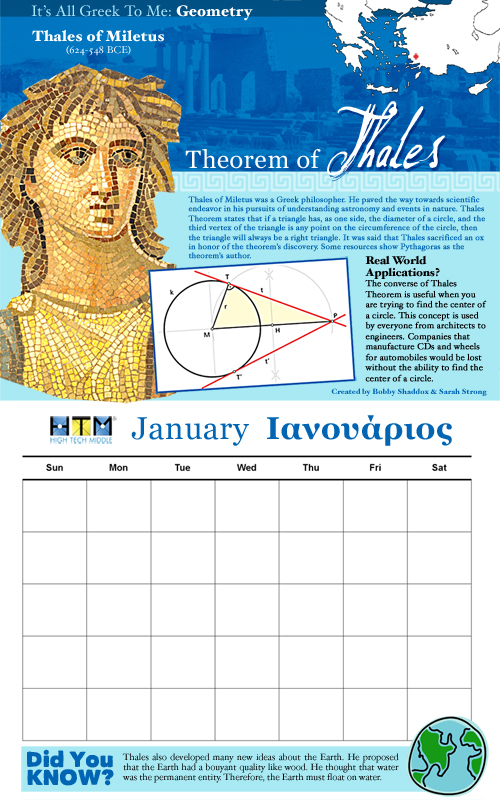 Our class will create an Ancient Greek calendar for the Hellenic Cultural Society of San Diego (They’ve commissioned our students to create this work). We will begin by learning about the civilization of the Ancient Greeks through an exploration of resources (texts, videos and artifacts). We will create artifacts to demonstrate our learning along the way. Finally, students will choose specific topics in which to become experts. In pairs, classmates will research their topic and create a page for our calendar (demonstrating their knowledge on the topic). The calendar will be presented to the public at HTM’s exhibition night. The board members of the Hellenic Cultural Society will be our honored guests. Our classroom will be transformed into an agora (ancient Greek marketplace) where visitors will meet the famous people (costumed students) featured in our calendar. What will we be able to explain and do in this project? ART: Depiction of the contribution, concept or idea. Additionally, choose a design motif or artistic element of Ancient Greece. How will we be partnered? 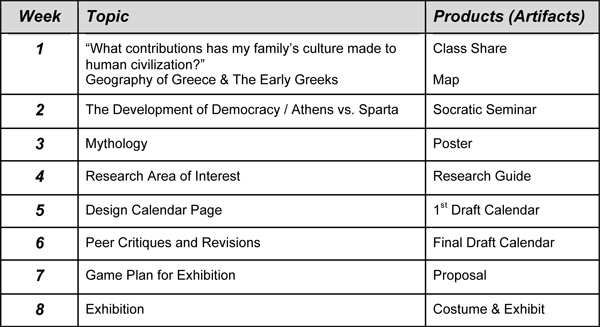 At the end of week 4, our class will brainstorm the possible topics for our calendar. We will construct a massive idea-web on our whiteboard. Individuals will pull ideas from this list to construct a list of their top 3 preferences. Along with topics, students will write their preferences for partners (as well as red flag partners). They will finally submit their preferences for review and Mr. Shaddox will construct pairs for the project. Each student will receive one of their top 3 choices in both topic and partner.